You are at:Home»Society»Military»November 11, 1993: Is There a Memorial to Female Veterans of the Vietnam War? November 11, 1993: Is There a Memorial to Female Veterans of the Vietnam War? The Vietnam Women’s Memorial is a sculpture by Glenna Goodacre (nee Maxey), of Lubbock, Texas. She is a graduate of Colorado and has lived in New Mexico since 1983. (She is now 78 years old.) The sculpture consists of three women tending to a wounded soldier. 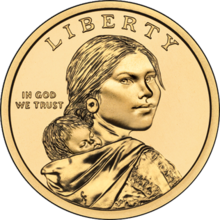 Another well known work by Goodacre is the obverse side of the Sacagawea dollar coin of the year 2000. Profile of Sacagawea with her child, Jean Baptiste Charbonneau. About 11,000 (90% estimated to be nurses) American women served in Vietnam during the American involvement in the War, with 8 of their names memorialized on “The Wall” memorial to those Americans killed in the War. All 8 of those listed worked as military nurses. Today the War on Terror is being fought in part directly by American women in combat roles, but this does not in any way diminish the incredible contribution to the war effort during Vietnam by American women. Just ask any veteran of the Vietnam War! Previous ArticleNovember 10, 1865: Were Any Americans Executed for War Crimes in the US Civil War?